This is the Mitsubishi ceiling cassette that we sell the greatest number of is the FDT50VG model. This package includes the full system indoor, outdoor unit and a hardwired controller and uses the latest inverter technology for maximum energy efficiency. 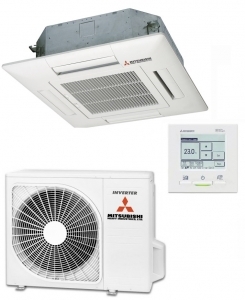 These systems are very popular for providing heating and cooling when needed in commercial office environments because of the reduced energy costs compared to electric only heating. Also take a look at our full fitting kits that are available to install these ceiling cassette systems. These systems are avialable with a special offer install kit see the options above comprising the below. Alternatively click this link to see our range of full fitting kits.